In this lesson, we will zoom in for a more detailed look at a small section of Revelation (6:1-17), which is part of John’s second vision that began in chapter 4 and runs through chapter 11. Our overview of Revelation 6–11 in the last lesson was necessary because contemporary readers have little experience reading apocalyptic literature. Many Christians even avoid Revelation entirely because they do not know how to deal with the texts describing violence. Instead of steering clear of this enigmatic book, let’s imagine that we are members of the church at Ephesus, one of the seven to whom John wrote in chapters 2–3, and look at Revelation as those church members would have understood it. John draws heavily from imagery in his Scriptures (especially Isaiah, Ezekiel, Daniel, and Zechariah), as well as from later apocalyptic writings such as 1 Enoch or 4 Esdras. Thus we can assume he has already taught us how to read apocalyptic literature as he made his circuit around Asia Minor from one house church to the next. The church at Ephesus may even own copies of some of these scriptures that John refers to. As the first four seals are broken (Rev. 6:2-8), we can see that they are consecutive pictures of riders on horses of different colors: white, red, black, and pale green. John’s descriptions are so vivid we can imagine each separate scene. Had the Internet been available then, John might have created short video clips on YouTube! Living in the Roman Empire, it was not hard for the readers of John’s book to understand these symbols. Only soldiers rode horses, and only a conquering general leading his army rode a white horse. Some say the rider’s bow represents the Parthian armies from the east, but in any case, the point is obvious. The red horse represents war. Resist a conqueror with “a great sword” of violence—and blood gushes onto the battlefield. But the other victims are the civilians, caught in the wrong place at the wrong time. Their plight is symbolized through the opening of the third seal showing a rider atop a black horse while holding a pair of scales. Many of the people flee, leaving behind possessions and crops. No one can till the land and grow food. Famine stalks the land. John makes this economic image all too real by showing the prices of wheat and barley to be eight or ten times what they normally are. “But don’t damage the olive oil and the wine” that wealthy, upper-class people consume (6:6)! The fourth horse is Death, pale green indicating the color of rotting bodies. Church members in western Asia Minor did not need a university education to understand this cycle of conquest, war, famine, and death. In the ancient world where Rome ruled, it was always happening somewhere. We do not know how many of the believers had survived famine from past wars, or were enslaved victims of Rome’s foreign conquests. These four broken seals revealed horrors they understood. The open fifth seal (6:9-11) reveals an entirely new scene: the souls of people martyred for the word of God. (If you think Christians “go to heaven when they die,” I doubt you had this picture in mind!) They rest “under the altar” (v. 9), a reference to Leviticus 4:7, where, in ancient Israel, the blood of a sacrificed bull was poured under the altar of burnt offering at the entrance of the tabernacle. Here John symbolizes the martyrs’ blood crying out to be avenged. If God is truly just and will reward their sacrifice, something besides the endless cycle of conquest, war, famine, and death must change. The martyrs are reassured that justice is coming if they “rest a little longer until the number [of their fellow sufferers ] would be complete” (Rev. 6:11). Only later in this apocalypse will we see how God’s justice and vengeance will be accomplished. However, the opening of the sixth seal (6:12-17) may be a partial answer, like the trailer of an action movie to be released in the future (forthcoming in chapters 17 and 18). Bruce Malina and John Pilch note that, in contrast to the way we understand our weather and natural phenomena today, ancient people considered lightning, thunder, tornadoes, eclipses, comets, and earthquakes to be signs from the gods, or God. For example, Jesus speaks of Satan falling from the sky like lightning (Luke 10:18) and describes many kinds of cosmic phenomena happening when the Human One “comes on the clouds of heaven” (Matt 24:29-31). See also my Lesson 3 of this series. Coincidentally, the week I wrote this lesson, PBS re-broadcast the “Nova” documentary describing the blazing meteorite that, in February 2013, streaked across Russia’s sky and exploded near one of its cities. The intense shock wave caused injuries and broken windows, but no one was killed. Afterward, scientists used this event to gain new knowledge about meteorites and the potential dangers they pose to Earth. No one mentioned signs from God! But how would that event have been interpreted 2000 years ago? 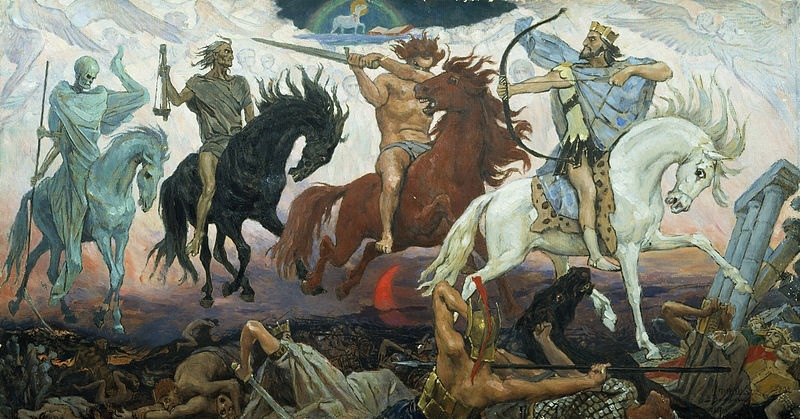 Do you see the “four horsemen of the apocalypse” as a future prediction or as a recurring cycle? If the latter, what evidence shows this is still happening today? In light of the slaughtered Lamb symbolism from chapter 5, how should we understand the martyrs’ cry to be avenged? If earthquakes, meteorites, and weather are no longer seen in apocalyptic terms, how should we interpret the sixth seal today?